Long View Park – it was originally spelled with two words – was probably the most “postcarded” place in Rock Island, with Spencer Square running a close second. You probably have seen many of the Long View postcards, but you might be surprised by this rare one. It shows the heavily antlered deer statue that surveyed Rock Island from atop Stag Hill. Stag Hill is still there despite all the recent earthmoving for the new swimming center. It’s a definite hill, right next to the eastern border of Long View Park, between the 17th Street entrance and the current chalet. But the namesake stag is gone. 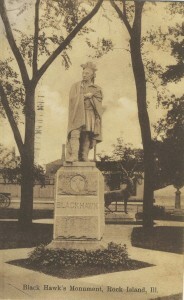 This statue dates from the earliest days of the park, because the postcard was mailed in 1910, only two years after the park was dedicated. Where did this majestic deer come from? What was he made of? And even more curious, where – and when – did he go away? Unfortunately there aren’t firm answers to these questions, but there is some speculation. Where he came from? It’s likely that he was a donation to the park from a prominent citizen of the era. The opening of Long View Park was a major and long awaited event. Designed to provide a spectacular amalgam of natural and contrived beauty, this once ordinary hillside was enhanced by a man-made watercourse, ponds, bridges and buildings. Through the years citizens were eager to add to this ambience with donations of statuary, pools, urns, and fountains. Even a real buffalo was once offered, in the hopes that a zoo would be incorporated into the lower levels of the park. It is interesting that a similar stag, but probably not the same one, also stood in downtown’s Spencer Square. It was near the center of the park on the 20th Street side, just behind a statue of Black Hawk, which much later ended up in Black Hawk State Park. The lions at the 18th Avenue hilltop corner of the park were gifts, with varying stories as to how they arrived at Long View. One has it that the pair came from Spencer Square, where they had originally been given by Frederick Weyerhaeuser. But photos of the Spencer Square felines have slightly different poses from those in Long View. In 1946, an Argus columnist wrote that these lions were from Ben Harper’s old house on 18th Street and were placed in Long View in 1931 when the telephone company razed the home. That story said one of Harper’s lions was accidentally broken, so a replica of the broken “crockery” one was made in metal. We don’t know what the term crockery means in this context, but the Long View lions were thin, soft, metal that was patched and repaired with concrete. In 2008, after much study, they were deemed too deteriorated to repair and, thanks to a gift from Stanley Goldman, were replaced with new solid metal replicas. As thoughts return to Stag Hill, it’s reasonable to assume that the stag was a donation. Stags were a popular choice for parks — in fact pioneer settler Judge Wilson Drury had much earlier contributed a stag to Spencer Square. Perhaps the stag figure was popular for its symbolic value. In early cultures, the stag was considered a most noble and proud entity, hence it represented leadership. Because its antlers resemble branches, in funerary art the stag was associated with the Tree of Life. And since those antlers are renewable, the stag was used as a symbol of regeneration. Did its giver mean the stag to have a symbol for us? Another question — what happened to this elegant creature – and when? 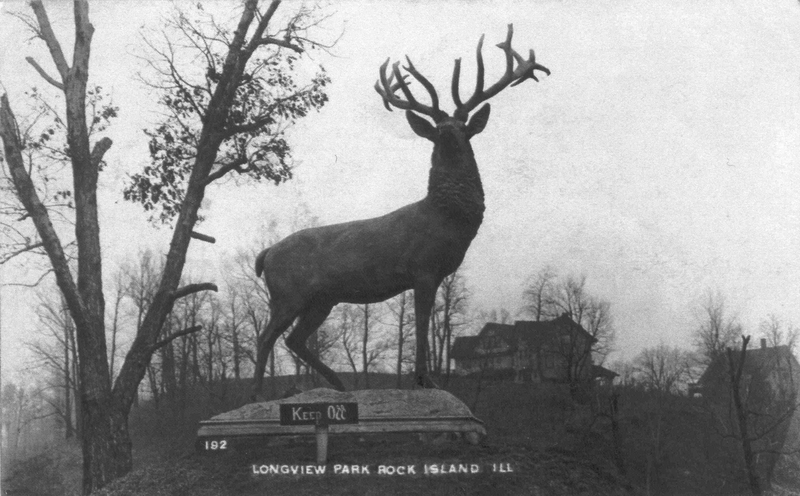 Thanks to a haunting photograph taken in Long View Park after a 1952 ice storm by Rock Island artist Ed Sigler, we can see that the stag was still standing then, albeit with antlers missing. Knowing this, it’s reasonable to speculate that he completely disappeared when the nearby swimming pool was built a few years later. Was he simply junked or is he still hiding in the greenery of someone’s garden, perhaps with new antlers? If you know, please tell us. And by the way, you don’t have to check out the stag in Deere Commons in downtown Moline – he isn’t the same as ours. Returning to the postcard, notice the house in the background. It is the new (at the time) home of Stuart and Grace Velie Harper which is still located on the hilltop across 17th Street from the park. It is now the parish house of First Lutheran Church. The Harpers’ original carriage house at the far right was converted into the church. This article by Diane Oestreich is slightly modified from the original, which appeared in the Rock Island Argus and Moline Dispatch on August 4, 2002.